- Be sure to visit our Visitor's Photo Upload Section where guests have shared their fishing photos with us. Upload your own! - For recent photos of our guests, please visit our Reports & Pix section! - Do you have a photo from a trip with us that you'd like to share? If so, please send it to us! Welcome to our Alaska Videos section! Below are links to a number of videos that we've transferred over from analog tape to digital format for you. Some of the videos below are very large, so be sure to check the file size before you start downloading! We're pretty sure that broadband access was invented just to download the contents of this section! We'll be adding some new videos soon, so please check back! "Oh great!, two people filming and no one to net my fish!" A short clip from an episode of Fisherman's Heaven TV show shot on Bob's boat on the Kasilof River during the August run of silvers. You get it all here: jumps, screaming runs, double-header pandemonium, tangled lines, burnt latex bait gloves, a less than flattering buns shot of Bob, and a good net job (a lousy one too) ... all in about a minute and a half. Large file, but everyone has broadband nowadays :), except us! 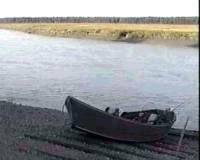 About a one minute clip of a leaping and running sockeye just downstream of the Russian and Kenai River confluence. 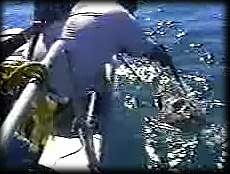 Please note this is a private party video ... we do NOT recommend netting fish like this ... DUCK! You'll notice the other sockeye rolling around the one that is actually hooked. Watch Bob flipping for reds, then hooking a wild one and the resultant attempts of the fish to land in Bob's lap and then cartwheel back into midstream flow. Fishgal's taping, and her giggles tell it all! says Fishgal to her Dad at the end of this video from the razor clam beds of Clam Gulch, Alaska. You can see Bob work with a clam gun, and if you choose the extended version, 'C' dig with the shovel, and Steve ... well let's just call his first attempt with a gun 'a whiff'. 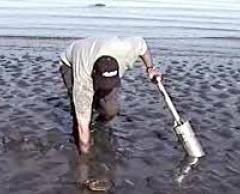 What it's like to be in clam diggers heaven! yells Captain Bill. All aboard show the fatigue of yet another 100 plus pound fish (six in all on this trip) aboard the Windigo on the waters of Cook Inlet out of Deep Creek / Ninilchik, Alaska on a beautiful August day. 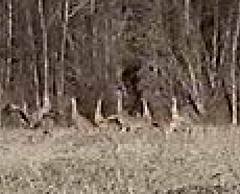 is the question asked of these Sandhill Cranes along the tidewater flats of Alaska's Kasilof River. While I can't say for sure ... their little hop is likely some sort of a 'mating dance'. Short video, about 10 seconds. 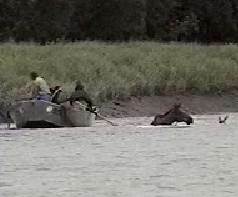 might be the next thing the anglers in the front of this driftboat are going to say to one another as Mama and Baby moose have a little trouble judging the river's current and nearly broadside this boat! From the ocean waters near Seward. A small group of Dall's Porpoises tags along with the boat as we head to shore. A fairly regular occurrence in these waters, this is still a really neat sight! 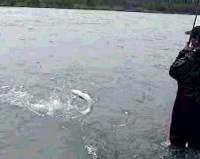 Just how fast and furious can sockeye fishing be? This video shows you! 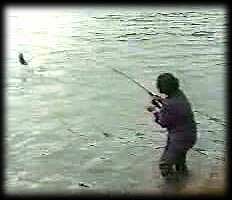 Hook up after hook up and double fish net jobs are just part of this video that the angler pictured to the left describes as our "Hollywood Video" ... actually, we'd describe it as the "Chamber of Commerce Video" ourselves! While we use a different ramp currently, the procedure remains the same! 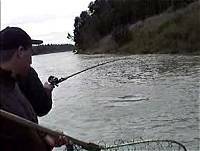 This is perhaps one of the most video-taped activities by our guests, especially on their second day of fishing after they miss it on the first before realizing what was happening! Along the shoreline of an island out of Seward, Alaska, Fishgal works a lingcod up from the depths of the ocean. Using whole rockfish as a bait, you can see how many lings are caught ... just holding on to another, smaller, fish used as bait. This ling turned out to be a little sub-legal, so you get the perfect release as he spits out the rockfish on top of the water. remarks Bob of this king salmon among several dozen others milling around near the spawning beds of Slikok Creek, a tributary of the Kenai River. we apologize about the wind noise ... just no helping it as we watched these kings chase one another on a breezy late June day. This a spot that is very easy to access that's we'd be happy to point you to during your stay. Wow, this is an old one! 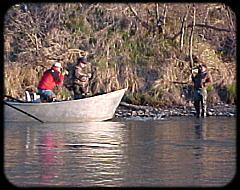 Watch the last fish of our '99 Alaska season come to the net in this 'from the bite to the net' video of a silver on the Kasilof River. Also the last trip that we used conventional tackle as our standard. 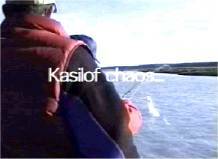 See the 'Kasilof Chaos' Video above for how we do it now! Murphy's Law would have it that this fish wasn't a terribly good fighter ... the one before was. Doesn't it figure that I forgot to take the camera off "Standby" and miss the previous one!! Just two sizes due very large file size with two-minute length. Large screen, medium quality ... 18.9 megs ... fast connections advised! With much improved video available online these days, look for lots of new stuff her soon! Washington Videos - Underwater salmon footage, steelhead fishing, lots of whitewater action, mass migration of salmon & more. Instructional & Miscellaneous Videos - How to put a sardine / herring wrap on a kwikfish, several videos showing how to tie useful knots, wildly leaping summer steelhead on a fly, Bob in a less than controlled fight with a fish & more!